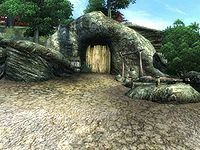 Dzonot Cave is a medium-sized cave west of the Imperial City containing bandits. It contains two zones: Dzonot Cave and Dzonot Main Cavern. This cave contains 13 Cairn Bolete plants. You have a 25% chance of meeting an Orc Adventurer here. 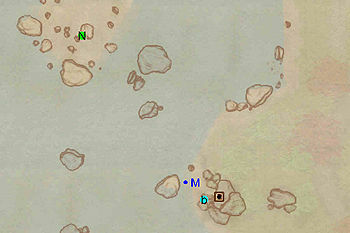 This location's map marker (M on map) is named Dzonot Cave (editor name DzonotCaveMapMarker). The entrance door is ESE of the marker, 40 feet away. 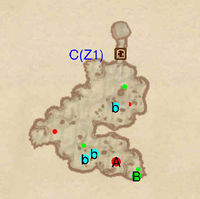 Over 30 items outside the cave are duplicated, causing two items to exist in exactly the same space. This can lead to odd effects, such as picking up an apple but seeing another apple in the same position. This zone is very linear even though it is spread out in three dimensions; the route takes the rough form of a left-handed spiral. When you enter the cave you're on the lower level of a two level area. Above you there will be at least one bandit, so sneaking along the canyon is a good idea unless you enjoy the smash and run approach to cave crawling. Almost immediately after entering the cave you will come across a tripwire. Take care to avoid this or you'll receive a log in the back of your head for your pains. Following the tunnel to the end, you may discover an Orc Adventurer; this will make stealth in the subsequent sections more difficult, as he or she is likely to be spotted by the bandit inhabitants. Bear right and you enter a cave with two bandits. You will often hear them before you see them as they ease their boredom by talking to each other. Each bandit guards a chest containing minor treasure. Continuing round the cave you will come across at least one more bandit, guarding a chest by the remains of a previous adventurer. Further round still there is at least one more bandit, usually guarding the bridge across the entry corridor. Continue round past another chest towards the exit. This zone takes the form of one large cave that curves around like a question mark from the perspective of somebody entering. 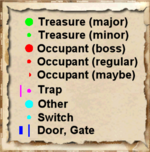 There will be a maximum of only three bandits in this area, one of which is a Boss. If possible try to kill the others off first. One may be directly in front of you when you enter the cave; the next will be around to your right. A sneaky arrow shot should take care of them. After that you can head for the boss in relative safety.